In this post, we will discuss how you can differentiate shipping days with delivery days in Order Delivery Date Pro for WooCommerce plugin. This feature is added in version 5.4 of the plugin. Shipping Days refers to the working days of your own company. Whereas, Delivery Days refer to the working days of your shipping company to whom you submit your orders for deliveries. There are many types of businesses who do not deliver the orders directly to the customers. They hire a shipping company to whom they send the orders and they make the deliveries to the customers. For example, you have online clothes shop where you do not deliver the orders to customers directly. You hire a shipping company who can deliver your orders. In such case, there is a possibility of having different working days of your company and the shipping company. So, you can use this feature from the plugin to set up different shipping days and delivery days for your business. Minimum Delivery Time (in hours), Same Day cut-off time and Next Day cut-off time options will be calculated on the shipping days (in enabled) selected. We will be discussing how the Minimum Delivery Time (in hours) will work with shipping days here. You can set shipping days under Order Delivery Date -> General Settings -> Date Settings under which you will find a section of Shipping Days Settings if you scroll down to the bottom of the page. To allow calculation of Minimum Delivery time on shipping days you first need to check the checkbox Enable Shipping days based calculation. After enabling the checkbox, you have to select the weekdays on which you can ship the orders to the shipping company. For example, if you do not work on Wednesday, so you have to select all the weekdays apart from Wednesday. For setting up minimum required time for delivery you can check the post here. This has detail information about how to setup minimum required time for delivery. Also, for setting up delivery days of your shipping company which will be enabled in the calendar on the checkout page, you can refer to this post. Once the shipping weekdays are enabled, the minimum required time for delivery will be calculated on the selected shipping days instead of the delivery days. 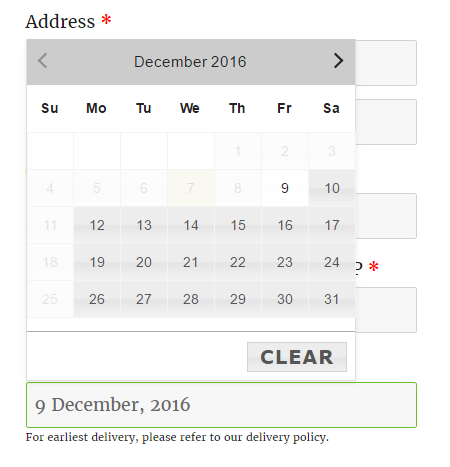 For example, if a customer visits your website on 7th December 2016 which is a Wednesday and the minimum time set is 24 hours. So, the first available date in the calendar will be 9th December 2016, as Wednesday is disabled for shipping and the minimum required time will be calculated on the first available date, which is 8th December 2016. In this post, we saw how minimum required time will work on the working days of your business and not on the delivery days of the shipping company. Same way, Same day delivery and Next day delivery will be calculated on the shipping days. We will be discussing that in our next post.